3 What Should You Know About Golf Clubs? 7 How Often Should You Upgrade Your Club Set? A club is the most important thing that you need to play the beautiful game of golf. It is also one of the things that make it a unique sport because you will need several types of clubs to play this game. As a beginner, this may not be very evident because most people who have never played golf think that players only use one club. There are very many types, and if you are playing a complete game, you will probably use all of them. Although it may look complicated once you get used to golfing and you know the different types available and their uses, everything will be straightforward. What Should You Know About Golf Clubs? The first question that most beginners will ask themselves is what golf club to use and when and also what are the best golf clubs for beginners. Although these are important things to know the first thing that you should understand is the basics about the golf club. Once you know this everything else will be simple for you and you will have no trouble choosing the right one for every shot. A golf club consists of three components that are the Head, Grip, and Shaft. Each of these components has a vital role to play, and the club would not be complete without any of the three. The grip is where you will hold it, and it has a soft material to ensure maximum comfort, but its design also ensures that you can hold the club firmly. The club head, on the other hand, is a critical component because it will affect the trajectory and accuracy. A shaft is the most underappreciated part, but it is still essential because it also has a significant effect on playability. The properties of the club shaft such as its torque and flex will affect playability, and so you can never overlook this when shopping for a club. Once you figure out the main components of a golf club, the next important thing that you will need to know is the number of clubs that you will need to play this excellent game. The USGA allows golfers to have up to 14 clubs in their bag when playing at a professional level. And this simply shows that the maximum number that you will ever need is fourteen. A best beginner golf club set of 14 clubs will consist of 1 Driver, 1 Putter, 1 Hybrid, 2 Woods, 2 Wedges, and 7 Irons. However, some golfer will prefer to vary the number of the Irons and replace them with some Hybrids depending on how they like to play. It is important to know that each type serves a specific purpose and although you can still use one club for various purposes it will not be as effective as using the one that is for that particular purpose. There are five main types of clubs, and although different manufacturers may make their Putter, for example, to look different from others, its purpose is still the same. And so as a beginner you will only need to understand their differences and most importantly the use of each one of them. The driver is one of the standard clubs that every golfer must have on his set regardless of whether he is a beginner or a professional. Among all the clubs in a set, it is the one that hits the farthest distance, and it is also the first club that you use when starting a round. A driver also has the longest shaft, the largest head, and the smallest loft. In golf, a driver is the designated 1-wood, and its primary function is to hit the tee shots on par-5s and par-4s when the ball is teed up. However, some pros and high skilled golfers will in some cases attempt to play it from the fairway, but this is something that takes many years of practice and experience to achieve. And so beginners should always stick to using it off a tee where it is most useful. Since the driver has the lowest amount of loft and the longest shaft, it is the most difficult club for golfers to use. But given that it is one of the most important in a set it is vital for an amateur or beginner to practice using it as much as possible as it is critical for the game. If you are having trouble teeing off with the regular drivers, the best idea is to go for something with a higher loft as it is easier to use. You can also use the higher loft ones to transition to the best golf drivers. Once you get the ball to the fairways, your driver cannot help you take it further than that and so you need to change into something smaller. The fairway wood is the club that you will need to make shots from the fairways. Its main differences from the driver are that it has a smaller head and the shaft is also shorter. In overall, the fairway wood looks smaller than the driver, and it does not stand out in your set like the latter. In addition to the small heads and short shafts, the fairway woods also have metal heads just like the driver. But, in the past, this club would have a wooden hickory or persimmon head, and this is where it gets its name. The fairway offers more accuracy than the driver, but this is at the expense of distance because it offers less driving range. However, if you use it well, you can still get both distance and accuracy. If you are not sure when to use a fairway wood a simple thing to remember is that it is the club that you should always turn to when you are more than 175 yards from the pin/flag. Also, you should also know that it is what you will use after making the first shot with the driver. Most golfers will have a 3-wood that has a loft of between 15 and 18 degrees and also the 5-wood with a loft of between 20 and 22 degrees. Irons are what you use when you are less than 200 yards from the green. There are different types of Irons available (3, 4, 5, 6, 7, 8, and 9), and they make up most of your golf clubs. It is important to note that the closer you are to the green the higher the best golf Iron that you should use. Some Irons such as 3 and 4 are harder to hit with than the others, and so beginners, ladies and most people with higher handicaps will often replace them with Woods that have a high loft such as the 7 and 9 wood. Hybrids are a more recent development in golf clubs because they came into the market about ten years, ago but in the past few years, they have become very popular. A hybrid consists of an iron length shaft and wood head design. What makes them perfect is that they give you the best of a Wood Club and also the positives of an Iron. They offer a very impressive distance and most players nowadays prefer to replace their 3 and 4 irons and also the 7 and 9 wood with the hybrid clubs. Although you can define wedges in many ways, they are just special types of irons that will help you make a particular shot. The first and probably the most important wedge is the Pitching Wedge (PW), and it comes with a loft of between 46 and 48 degrees. The loft increases by four degrees, and so they often come in 64, 60, 56, 52 and 48. They are very useful to your game, and so most golfers will have a few of them. You will need them when you are closer to the green, and so their design emphasizes more on shot shaping and shot control. Just as the name suggest a putter is a club whose primary purpose is to put the ball in the hole. The best putters will only help you once you get the golf ball on the green and so on other things such as getting the ball out of the sand traps you have to rely on the other clubs. A putter comes in various styles such as long, bent, belly, short, heel-toe, mallet, center-hosel and many others. Beginners have a harder time choosing the right equipment than even knowing how to play the game well. However, this is just because they do not have the right and enough information. Golf is a complex game especially when it comes to clubs because you will need to own more than a dozen of them. Finding them should not be a problem because there are hundreds of manufacturers out there but you should aim to find the best. And for this to be possible, you should always consider the following important things so as to buy the best golf clubs for beginners. Should I Buy Individual Clubs Or A Complete Golf Set? One of the first challenges that most golfers will always face is whether to but individual clubs or to purchase the entire set. While both methods of acquiring the clubs might still work, there are some important things that you need to know so as to make the decision easier for you. The first thing that you should understand is that buying individual clubs can be more expensive than purchasing a complete set. And so as you are starting out it might be a good idea to go for a full set so that you can save some cash. Also going for a set will save you time as you will not have to shop around for the various clubs that you will need. But your main aim should always be to find the best golf clubs for beginners. Buying a set might also not be a good idea in some instances because when starting out you will not need all the clubs in a full set. A driver, a few irons and fairway woods and a putter are probably all you need as a beginner. Buying the few clubs that you require individually might be cheaper than a complete set, and this is more so if you go for second-hand ones. The choice between individual clubs and a set is all about personal preferences and budget. Also, if you plan to play the game for the long run buying a high-quality set might be better than purchasing a few second-hand individual clubs. A first-time golfer has many things that he or she needs to understand when shopping for golf clubs. However, few of these things if at all any are more important than knowing the types of best starter golf clubs that make a complete set. And the good thing is that this is very easy because it is common knowledge that any full set should have Irons, Wedges, Fairway Woods, Hybrid, and Putters. The USGA allows for a golfer to have a maximum of 14 clubs in their bag and most experts will also recommend that you have between 12 and 14 when playing in a professional tournament. It is also important to know that the number of each type of club in a set will vary from one player to the other as it depends on their style of play but for most golfers the hybrids and irons make up the bulk of them. You should decide your goals before you go shopping for the clubs. It is one of the most important things that a beginner should do because it will have a significant effect on the type of golf club that he or she should buy. For example, you should be clear with how often you intend to be playing golf and whether you hope to become a pro someday and participate in tours or not. If your goals are to play golf a few times a year, then you should not spend a lot of time, money and effort shopping for the clubs. However, if your plan is to be playing at every opportunity that you get or want to become a pro then you can invest more resources in your search for the perfect clubs. The shaft is the long rod that is between the grip and the club head. Although most people tend to underappreciate it, a shaft is a critical part of the club, and you also have to know what to look for to get a club with the right one. It is usually a piece of graphite or certain types of metal, and its length will depend on the kind of golf club. The shaft comes in various flexes, and this affects its performance, and so you should know how to choose the right flex. Clubhead speed is what determines the ideal flex for a swing. Clubs will come with different shaft labels, for example, an “L” that means it is for ladies. An “A” or “M” will be for Amateurs, “S” for Stiff, “R” for Regular and the last one is “X” that means that it is Extra Stiff. And so as a beginner you should go for a shaft with an “A” or “M” shaft label because you are still an amateur, and this is what will perform best for you. First-time golfers will always find themselves in a dilemma on whether to buy new clubs or used ones. Both are readily available, and they also have advantages and disadvantages, and so it becomes difficult for most beginners to choose. If you are not sure whether you will still be playing golf, in the long run, you should go for used clubs. Used clubs are way cheaper than new ones, and you can get the opportunity to bargain with the seller. And in case you damage one you can easily replace it in future without feeling a pinch because they are cheap. New ones, on the other hand, may be high quality and very durable, but you will also pay a lot more for them and the worst thing is to end up rarely using them. When you are starting up it is advisable to start with used clubs and upgrade to new as you get used to the game. Club fitting is something that most people tend to overlook, but it is an important thing that you should consider when buying clubs. The standard size ones that you take off-the-shelf in a sports shop are ideal for a man who is 5 foot 10, and so they will be perfect for you if you are around this height. However, if this is not the case, then you will need to do club fitting to ensure that your clubs suit your body type. Club fitting is also very simple as it only involves taking different body measurements such as height and the length of your arms to determine the right size for your golf clubs. It will only take you less than one hour, and it will ensure that you get to swing something that it comfortable for you. Just like most other golfing gears, clubs are very expensive and so you have to set your budget first before going out to buy them. What you are willing to spend will depend on your dedication to the game. If you are intending to be playing regularly, you will do best with high-quality ones that are also more expensive than the others. However, as a beginner, it is advisable not to spend a lot of money on your first set so that in case you give up on the sport few months down the line you will not have wasted a lot of money. All in all, you should only buy what is affordable to you and try to stick to your set budget. It is a grave mistake to but any clubs without first finding out what other players who use them or have used them in the past have to say about them. As a beginner, customer reviews are one of your most reliable sources of information because the chances are that it is your first time to buy golf clubs. And so if you want to be on the safe side you should take some time to go through golf club set reviews in different websites before you decide what to buy. Golf is an enjoyable sport, and you can always be confident of getting some memorable moments on the course, and this is regardless of whether you are a pro or armature. When starting out, there are many things that you will need, but the clubs are the most important because without them you cannot play the game. For a beginner, choosing the right clubs is not always easy, and most will not even know what to buy. But our set of golf clubs reviews below can help you to have a good choice. Callaway is one of the most trusted names in the golf equipment manufacturing industry. The Strata 12 piece set is designed with an average beginner in mind, and it comes with every club that they might need to play the game. Everything from the driver to the putter is high quality, and it has all it takes to ensure maximum performance. And to top up everything they all come in a beautiful stand bag that also has some pockets for all your valuables. Driver: This set comes with a forged driver that is 460cc, and it also has a large sweet spot that will offer a beginner more forgiveness than when they are using other drivers. Fairway Woods: Just like the driver the 3-wood is very forgiving, and it has an aerodynamic head shape that will give a golfer long and high flying shots. Wedges/Irons: The stainless steel irons in this set are the best golf clubs for beginners that a beginner can ever wish for because they will offer him/her a great combination of forgiveness and control. Hybrids: Hybrids are a golfer’s best gift as they will provide a great alternative to long irons. The ones on this set are not only high-quality but also give a new player more confidence in each shot that he makes. Putter: Accuracy should be the least of your worries when using the putter on this set because it has a T-Style alignment to ensure accuracy. Stand Bag: The stand bag is lightweight and durable with five convenient pockets for all your gear and an extra one for your beverage. It also has a matching rain hood and a backpack strap to make it easy to carry around the course. The bag is good looking, and the material is also high-quality meaning that it will keep your clubs safe. 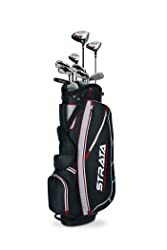 It is a very affordable golf set, and this makes it perfect for a beginner. Most of the clubs hit well and further than most others on the market. Apart from being high-quality, the bag is also lightweight and also has plenty of pockets. These clubs are very durable, and you can be sure that you will use them for many years. The bag also has some back straps that make it easy to carry around the course. The putter in this set looks cheap and less durable. It does not include a sand wedge, and so you may need to buy one at an extra cost. Some customers complain that the grips can be a little bit rough on the hands if you do not have gloves. Other beginners also have issues with the driver as they find it harder to use than others. If you are a beginner and are having trouble making a perfect swing or getting the ball from the sand trap, then you need to buy this 18-piece complete set from Callaway. It is an affordable club set that not only has everything that you need, but they are also top quality. 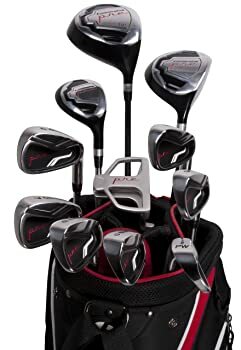 The set comes with six irons, two wood, two hybrids and a best golf driver (460cc). Putter: It has a typical Callaway putter that will offer a new player accuracy and also make aiming easier for them. Irons: When you buy this set you get six top notch irons that will help you take your game to the next level within a short time. Hybrids: This set comes with two hybrids (4H and 5H) that are very flexible and forgiving, and this is more so when you are taking challenging shots. Fairway Woods: The set also has two fairway wood that is 3W and 5W made from stainless steel, and they also have very light graphite shafts that will not only provide rapid swings but also ensure you get long distance shots. Driver: Strata Ultimate Complete Set comes with a standard size 460cc Driver that will offer you a very generous sweet spot so that your shots can cover more distance. Bag: The clubs come in a beautiful stand bag that is also very lightweight and durable. Apart from this, it also looks stylish, and it has many pockets for other golfing gears. Weight: With all the clubs the total weight of this set is only 25 pounds, and this makes it a lightweight complete golf set. These clubs have some fantastic grips, and so they are very comfortable in the hand. The drivers are very forgiving, and so they will perform perfectly for a starter. It is an affordable set, and so a first-time golfer will not have to spend a lot of money. This set comes with 18 pieces meaning it has all the clubs that a golfer can ever need. You get better control and also high-flying shots when using these clubs. The bag has plenty of storage space, and it also looks very stylish. The shafts would do with some improvement because they snap easily. You will need to upgrade the driver after a while meaning you have to spend more money. It comes with a bag, but it is a little bit flimsy. Both the bag and clubs do not have a “Callaway” logo, and so it is not possible to differentiate originals from counterfeits. Everything about the Wilson Complete Golf set is very straightforward. However, all the clubs are innovatively designed to perform their functions and also to ensure that any new golfer improves his skills within a short time. The stand bag is also a plus as it not only helps you transport the clubs but also gives you some storage pockets for other things. Set Makeup: This set has 3 Woods, Iron 5-PW, a Driver, 4 Hybrids and a putter hence making this a full suite for a beginner. Materials: The driver and wood have graphite shafts, and this means that they are dependable and durable. The hybrids and irons have steel shafts that will give you strength and control. Putter: It comes with a modern putter that will help a new golfer gain precision and improve his putting skills. Stand Bag: The set comes with an ergonomic stand bag that is also very durable and three covers to protect your precious clubs. It is a complete golf club set, but it is still very affordable for most beginners. This set comes with three covers that you can use to protect your most valuable clubs. The clubs swing nicely, and they are also high quality and durable. Its clubs are standard size, and so they will be comfortable for most men. Wilson also gives this set a nice bag with a lot of storage space. The hybrids are fantastic, and every new player will love them. Users complain that the driver’s head break off within a very short time meaning you have to replace it. This set does not come with a sand wedge and so you have to shop for one. It comes in only yellow, and so you don’t get an opportunity to choose between various colors. There are many golf sets out there, but few are as complete as this 16-piece set from Pinemeadow because it also comes with a dozen golf balls. However, this is not the only thing that makes it a good buy because it also has high-quality stainless steel irons, titanium-enhanced driver, a 3-wood with a graphite shaft and a mallet putter that will give a golfer more confidence. Driver: The driver in this 16-piece golf set is titanium enhanced with a 10.5-degree loft and a robust and durable graphite shaft. Irons: It comes with 4, 5, 6, 7, 8, 9 and the pitching wedge irons and they are all made from stainless steel making them not only high performing but also very durable. Hybrid: The hybrid is a 21-degree, and this makes it comfortable for a new player and also gives him better control and guarantee of high flying shots. Wood: The set has a 3-wood with a loft of 15-degrees, and the best thing about it is that the shaft is a pure graphite, and it has a low profile to ensure that a golfer always gets straight shots. Putter: It comes with an impressive mallet putter that will let you align every shot, and it gives you a lot of confidence in your putting aspect of the game. Stand Bag: This bag comes with a beautiful stand bag that has many pockets for all your gear and also hooks for your towels. Apart from this it also has dual straps that make it comfortable and easy to carry. 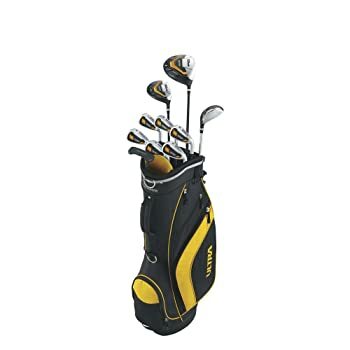 Extras: When you buy this best beginner golf clubs set you also get a dozen golf balls at no additional cost, and this is more than what most others will give you. You also get three headcovers for your driver, 3-wood, and a hybrid. Although they have a cheap price tag, they are still top notch quality clubs. Stand bag is high quality, and it has many pockets and hooks for your towels. This set is easy to carry around because the bag has some comfortable backpack style straps. You can be sure of better control because the irons and 3-wood have impressive crafting. The driver is very forgiving, and this makes it perfect for newbies. You also get plenty of golf balls when you but this fantastic set. There have been a few complaints that the driver breaks after a short time. Some players also have an issue with the pre mallet putter because it does not seem to be balanced. The 21 degree 3-hybrid awkward, but this should not be a problem once you get used to it. It would have been even better than it is if they also included a 5-wood because it is very helpful on the green. Buying a golf club set is always a much a better idea than buying the clubs individually as it ensures you not only have all the necessary clubs but also save some money. If you are a beginner or intermediate golfer looking for a top-notch quality club set to help improve your game, the Precise M5 is a great choice. It is a complete set with every club that you need from a 460cc titanium driver to stainless steel woods and irons, a hybrid and putter. 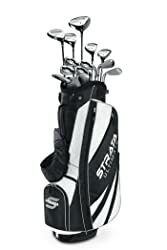 Also, this high-quality set will come in a stylish dual-strap bag to help keep the clubs organized and ensure that you do not have to spend more cash on a bag. And there are also some matching headcovers to help protect your clubs when in storage. Set Composition: Precise M5 is a complete golf club set that is designed to ensure that golfers have everything that they need to play the game. The set includes a titanium driver, fairway woods, a hybrid, 5-PW irons and a putter which are the clubs most beginner and intermediate golfers will need. Shaft: For the shafts, you get 100% graphite shafts on the woods which make them lightweight and easy to swing, and true temper steel shafts on the irons for enhanced performance and durability. Oversized Heads: The clubheads on most of the clubs on this set are oversized to make them user-friendly and with an off-set that ensures even beginners will have an easy time getting the ball airborne. Extras: Like with most other high-quality golf club sets, Precise M5 also comes with some nice extras which include a bag with shoulder straps for easy carrying and headcovers for the large clubs. It is always hard to determine the right time to upgrade golf clubs because just like when making a choice on what to buy it is all a matter of personal preferences. However, different factors should influence the decision on when to upgrade. As you are beginning to playr the game, it is always a good idea to go for simple or basic clubs that will help you learn how to play and are suitable for your handicap. But as you continue understanding the game you should upgrade to better quality clubs because your handicap will also change. Also, when starting out, you might not need to buy a complete set but as your skills improve you can upgrade to a better and complete set. The quality of the clubs will also determine how often you need to change them. If you have the best golf club sets or the high-end ones from a reputable company, it will take quite a while before you need to upgrade. In fact, it is not uncommon to find people that use the same set for more than a decade. However, technologies are always changing, and golf clubs are not what they were ten years ago and so to get the benefits of the improved clubs you might also need to upgrade your set often. Finally, the best idea is to watch out for wear and tear in your clubs and buy new ones based on the needs that you see in your set or replace the ones that no longer perform optimally. Information is the most important thing that a beginner needs when shopping for golf clubs. Without the right information, you are very likely to make the wrong choice and end up with regrets. However, with the seven important things above in mind, you will never have to regret because you can be confident of buying the best golf clubs that will help you start your golfing career on the right foot.